Shop Bar 10 Beef Now! Passionate farmers and ranchers with the vision of a better and healthier world understand that the basic foundation of all life is really about one thing: microbiology. One gram of healthy soil can contain over 5 billion microbes. We started out as ranchers who came across the country to settle an untamed landscape in the 1800’s and over the past 5 generations we’ve become soil biologists. As we strive to do it right, all natural, we’ve seen a direct correlation in the efficiency, quality of life and nutrient levels in the beef. Our soils are never sprayed with chemicals of any kind, we rotationally graze our cattle and often times a certain pasture may not see cattle for years. It has always been in mans best interest to care for the soil as we, thousands of years ago, understood that healthy soil produces healthy and tasty mineral rich grasses which produce healthy and happy cows. This symbiotic evolution of man to ruminant to grass is a special connection that can only be understood as we take care of our bodies and appreciate our food. The real questions shouldn’t be “Why Grass-Fed?” it should be why anything else? Grass Fed Beef is lower in fat and calories than grain fed beef. For example, a 6-ounce steak from a grass finished steer has one half to one third the amount of fatand about 100 fewer caloriesthan a 6-ounce steak from a grain fed steer. Assuming that you eat a typical amount of beef (66 pounds a year), switching to grass fed beef could save you approximately 18,000 calories a year and if everything else in your diet stayed the same, you’ll lose about six pounds a year. Grass Fed Beef has about the same amount of fat as skinless chicken, wild deer or elk, and like these other lean meats, it actually lowers your LDL cholesterol levels. Omega 3s are “good” fats, as they are the most heart-friendly of all fats. People who have ample amounts of omega 3s in their diet are less likely to have high blood pressure or an irregular heartbeat and are 50 percent less likely to suffer a heart attack. Omega 3s are essential for your brain as well. People with a diet rich in omega 3s are less likely to suffer from depression, schizophrenia, attention deficit disorder (hyperactivity), or Alzheimer’s disease. Omega 3s also may reduce your risk of cancer. Studies show that these essential fats have slowed the growth of a wide array of cancers and also kept them from spreading. Omega 3s are formed in the chloroplasts of green leaves and algae. Sixty percent of the fatty acids in grass are omega 3s. When cattle are taken off omega 3 rich grass and shipped to a feedlot to be fattened on omega 3 poor grain, they begin losing their store of this beneficial fat. Conjugated Linoleic Acid or CLA is another type of good fat. Grass fed beef contains three to five times more CLA than conventionally fed beef. CLA may be one of our most potent defenses against cancer. In studies, women who had the highest levels of CLA in their diet had60 percent lower risk of breast cancer than those with the lowest levels. Switching from grain fed to grass fed meat and dairy products places women in this lowest risk category. Grass fed beef is also higher in vitamin E. Vitamin E is linked with a lower risk of heart disease and cancer. This potent antioxidant may also have anti-aging properties. Most Americans are deficient in Vitamin E.
At the Bar 10 Ranch, we raise All Natural Grass Fed beef. We don’t implant our cattle with hormones, growth-promoting additives, or antibiotics. We are content to let the animals grow at Nature’s pace. Because of their natural diet and environment, they live very humane, low-stress lives and are very healthy. 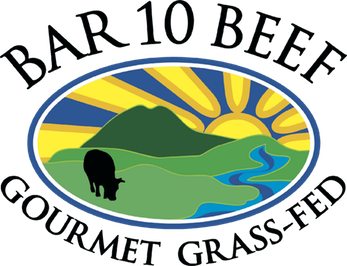 When you choose Bar 10 All Natural Gourmet Grass Fed Beef, you are eating the food that nature intended. You are also supporting your local farmers and ranchers, protecting small farms and rural communities, helping to protect the environment, and providing your family with food that is nutritious, wholesome, and delicious.